Although Kaufmann’s department store is no longer in existence, the clock that has been attached to what was once known as the Kaufmann’s building at the corner of Smithfield Street and Fifth Avenue, where the store was located, is still there keeping time. Prior to this clock, there was a free-standing clock on a tall pedestal at the corner. 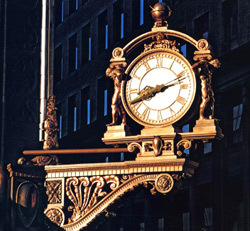 However, since 1913, this 2,500-pound ornately beautiful bronze clock has been presiding over the crossroads of the city. It has become an icon in Pittsburgh, so much so that the phrase “Meet me under the Kaufmann’s Clock” is as ingrained in the Pittsburgh lexicon as “Here we go Steelers.” In 1981, the clock was designated a landmark by the Pittsburgh History & Landmarks Foundation. Unfortunately, Kaufmann’s went out of business in 2006. When Macy’s took over the retail spot soon after, people never took to calling it the Macy’s clock. Macy’s shuttered their downtown store in 2015, and the 13-story building has now been developed into luxury apartments known as Kaufmann’s Grand on Fifth. Luckily for Pittsburghers, Kaufmann’s clock is still ticking more than 100 years later.